book's launch will be in a ceremony at Glasgow Central Station at 10.15am with Right Hon The Lord Provost of Glasgow, Liz Cameron, along with the historic steam locomotive 6201 Princess Elizabeth, which will be running a special train from Glasgow Central that morning. Last edited by Pgcc93 on Thu Dec 28, 2006 2:00 am, edited 1 time in total. Want to see something steaming in Glasgow Central other than the usual drunks of an evening? Clocked it or should that be 'spotted'? earlier crossing the Clyde. It looked quite impressive from a distance with all that smoke billowing. Oh well, need to wait till April for the next one! First time I've seen a steam train in action though, the smoke was indeed very impressive! Atsa cracker, G-man, the B&W version is sublime. Anybody buy the book yet ? Is it worth it ? glasgowken wrote: Anybody buy the book yet ? Is it worth it ? Only seen it on the afore mentioned website. Not been round the main bookshops in the town yet. £19.99 was the quoted so it better be exceptional quality at that price. I tried to buy this book yesterday from Waterstones / Borders - Borders have got 14 on order but can't confirm when they'll receive the stock. The book is excellent - it was in my Chrissy stocking this morning!! Best of all I get an acknowledgement as one of my photographs is used in it. Big buzz to see my name listed with the famous railway photographers like Derek Cross, H.C. Casserley, W.A.C. Smith. Family have officially classed me as unable to live with for the day. For those old enough to be around in 1977 would have been well aware that it was the Queen's Jubilee Year. Marking the Queens 25th year on the throne or something? *Appologies for the quality but the originals were under exposed. With duties complete HRH departs pronto! and as a bonus for our HG rail enthuasiast's electric loco 87 001 Stephenson was also in town stabled in 2 loop. Who cleaned up all the droppings, station staff? Sod the Royals, great photo of an unrefurbished class 126 in Platform 13! Great pictures Mr pgc. And I like the shot of the 87 - the best locos ever to work BR. I remember being at Central the day the new electric service first started - May 1st (I think) 1974. Amazing sight seeing electric locos gliding in and out of the station instead of 50s, 47s and Peaks. Alicydon - I got a cab ride in one of those dmus - or similar - on a run to Stranraer one time. In those days the drivers were that friendy that it wasn't unusual to be invited in if you were showing an interest. Happy trainspotting times. 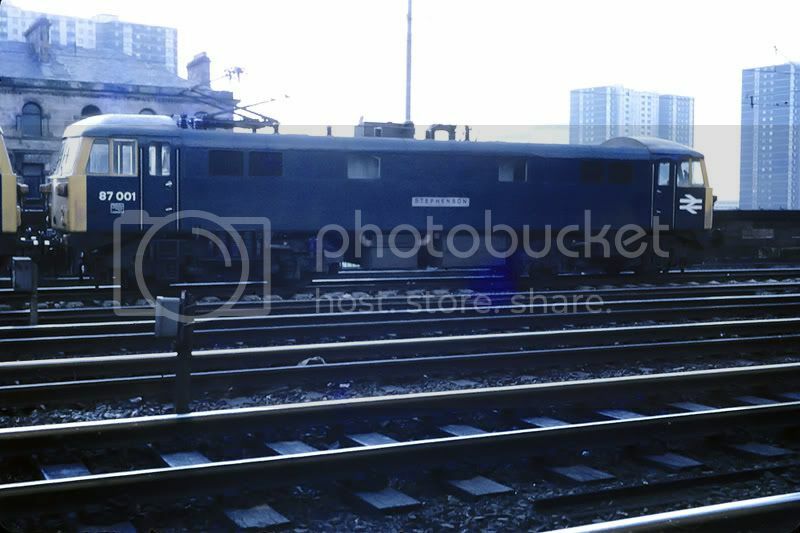 And coincidentally enough the first loco I ever 'cabbed' was the Deltic Alicydon at Waverly - probably circa 1972/3. Pgcc93 wrote: With duties complete HRH departs pronto! St Enoch in the background sans station roofs.